There’s been no shortage of rumored release dates for AMD’s Radeon 300 series, but a new set of rumors (which look fairly solid) indicate the 300 series will indeed be launched in June. The ‘lower’ end parts of the Radeon R9 300 series will be launching on June 18, while the R9 390X Fiji will be in the hands of customers on the 24th June, 2015, according to this rumor. This rumor is thanks to BenchLife, who have a pretty good history with the release date crystal ball, and thus it’s possible these dates could well be fairly accurate, particularly if you look at the events surrounding the date. The great news is that Lisa Su, AMD’s CEO, confirmed that the product launch would happen at a big event within the next few weeks. There’s only one big event (that I can think of anyway) and that’s E3 PC Gaming event, which is mid-June. This also coincides with rumors from a few days ago that OEM’s will be releasing PC’s with an R9 380 option, also in June. E3 runs from 16 June, 2015 – and thus would be a pretty good time for AMD to dazzle gamer’s (particularly as this year’s E3 will have a lot of PC focus). From what we understand given the rumors, the top end part of the R9 300 series, the R9 390X, will feature 4096 shaders, with its redesigned 1.3 GCN architecture and 1.05GHZ core putting out around 8.5TFLOPS of performance. Perhaps the most talked about feature of the Fiji XT is the confirmed decision of AMD to use HBM1 (High Bandwidth Memory), giving the card a rather tasty 640GB/s memory bandwidth. Rumors say we’ll have both a 4GB and an 8GB variant of AMD’s top end card. Compare this to the R9 290X Hawaii XT’s 5.6TFLOPS and 320GB/s memory bandwidth thanks to its 2816 shaders and GDDR5 memory, and we are looking at a rather hefty difference. 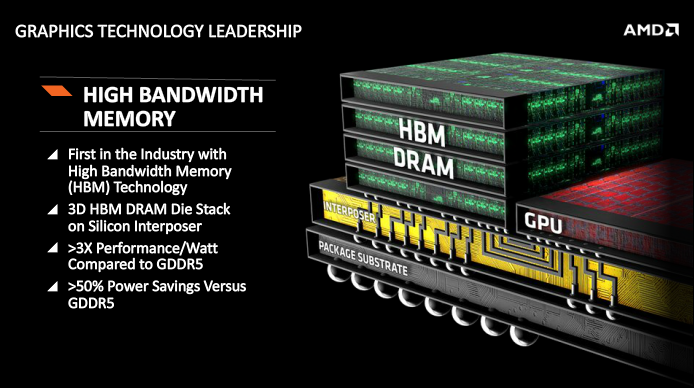 As we previously discussed, AMD will be the first company on the market with HBM, and will be using a 3D HBM DRAM Die Stack on an interposer. In case you missed my previous article (linked above), the GPU will sit next to the HBM (High Bandwidth Memory) stack, and the interposer will connect the two together. AMD say this will provide over 3x the Performance/Watt when compared to conventional GDDR5 RAM, while also providing over a 50 percent power saving. These details were confirmed at AMD’s live investors analysts webcasts a few days ago, and furthermore that the card would be geared towards Virtual Reality – AMD once again citing its own LiquidVR technology as an example of this. With the card said to sport a considerably smaller PCB (thanks to no GDDR5 RAM) it’ll be a very interesting product… once we finally see the R9 390X on store shelves. Tagged with AMD, GCN, gpu, graphics, R9 390x, radeon.